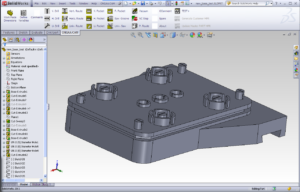 The Solidworks ‘Pack and Go’ feature is an indispensable tool for copying entire assemblies when replicating previously completed work. The only shortfall of this tool when used with ONGAA CAM is that external information could not be included and this would result in manually copying ONGAA CAM files and renaming them if parts or assemblies were renamed during the Pack and Go process. The original ONGAA CAM Pack and Go feature would copy parts and assemblies WITH the ONGAA CAM programs but would not allow renaming of parts. Not being able to rename caused extra work if renaming was required. It is not often that a customer is so pleased with a product that they take extra time to say ‘thank you’. In this case the thank you came as ‘The First Part’ the customer produced with ONGAA CAM. 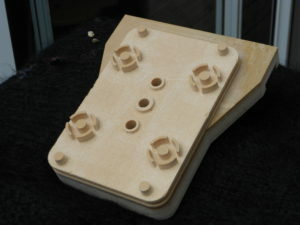 The part was modeled in SOLIDWORKS 2011 and used ONGAA CAM V1.140 for the HOMAG series CNC machines. Once processing was applied,ONGAA CAM produced the MPR file (compatible with WoodWOP 5 and 6) used to NC Gen the final instructions. The only issues we ran into was getting the part drawn accurately. The beauty was as we corrected the drawing,all our processing moved with it. ’No recalculations required!’.